The parathyroid glands are the only known source of circulating parathyroid hormone (PTH), which initiates an endocrine cascade that regulates serum calcium concentration. Glial cells missing (Gcm2), a mouse homologue of Drosophila Gcm, is the only transcription factor whose expression is restricted to the parathyroid glands. Here we show that Gcm2-deficient mice lack parathyroid glands and exhibit a biological hypoparathyroidism, identifying Gcm2 as a master regulatory gene of parathyroid gland development. Unlike PTH receptor-deficient mice, however, Gcm2-deficient mice are viable and fertile, and have only a mildly abnormal bone phenotype. Despite their lack of parathyroid glands, Gcm2-deficient mice have PTH serum levels identical to those of wild-type mice, as do parathyroidectomized wild-type animals. 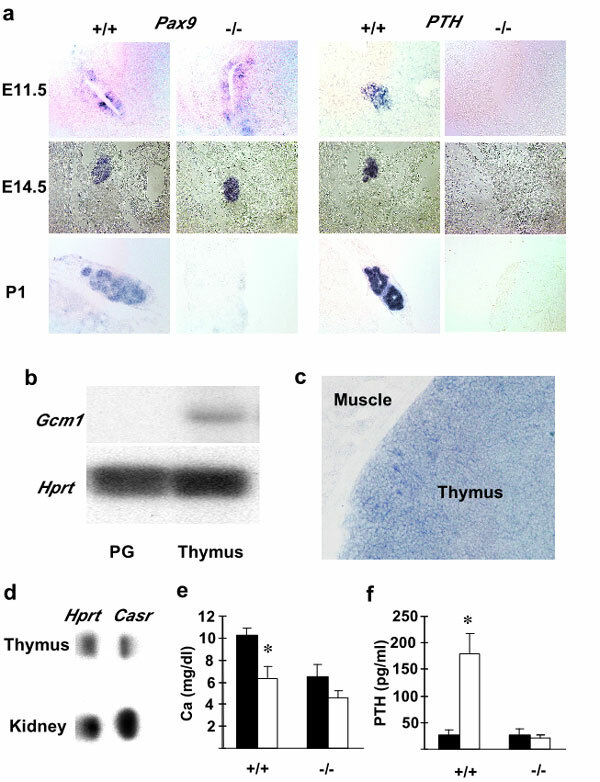 Expression and ablation studies identified the thymus, where Gcm1, another Gcm homologue, is expressed, as the additional, downregulatable source of PTH. Thus, Gcm2 deletion uncovers an auxiliary mechanism for the regulation of calcium homeostasis in the absence of parathyroid glands. We propose that this backup mechanism may be a general feature of endocrine regulation. © 2000 Macmillan Publishers Limited. Received 17 January 2000; Accepted 22 May 2000. G.K. thanks R. Behringer for his generosity. We thank R. Balling, R. Civitelli, C. Johner, H. Kronenberg, B. Lanske, J.Mclaughlin, H. Peters, L.D. Quarles and S. Rebalo for reagents and advice, A. Arnold for sharing unpublished information, and R. Behringer, H. Bellen, P. Hastings, C. Silve, H. Zoghbi and members of the Karsenty laboratory for critical reading of the manuscript. This work is supported by a grant from the MOD foundation to G.K. and NIH grants to G.K. and D.A. T.G. was supported by the Deutscher Akademischer Austauschdienst (DAAD). D.J.A. is an investigator of the Howard Hughes Medical Institute. Gunther, T., Chen, Z.-F., Kim, J., Priemel, M., Rueger, J. M., Amling, M., . . . Karsenty, G. (2000). Genetic ablation of parathyroid glands reveals another source of parathyroid hormone. [10.1038/35018111]. Nature, 406(6792), 199-203.